Airy sprays of tiny, long-lasting, rich-mauve, pompom-like flowers on slender dark purple stems above clumps of fern-like, grey-green leaves. This much sought-after double variety of meadow rue is perfect towards the back of a moist herbaceous border. To minimise wind-damage to the dainty flowers grow in a spot where it is sheltered and supported by neighbouring plants. Thundercloud, also known as Purple Cloud has flowers with dark purple stamens. 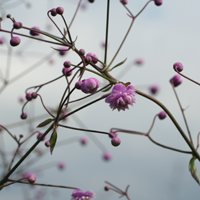 Grown for its attractive flowers and foliage, Thalictrum has clump forming, silver-green foliage and tiny mauve flowers with bright purple-pink or white stamens. The fluffy, clustered blooms are borne on long stems. These like semi-shade, moist, well-drained soil, and are very good for border plants and woodland gardens. A vigorous and tall variety. Heads of white flowers from purple buds on tall purple stems. Sumptuous blue foliage, dark in spring. A pastel color combination all in one plant. In spring, the shoots emerge purple then unfurl their finely cut blue-green foliage. The flower clusters look like clouds of mauve and cream. Tall and self-supporting, ‘Elin’ is superb at the back of the border. Easily grown perennial if given that traditional moist but well-drained soil with some organic fertilizer. Protect from harsh afternoon sun. 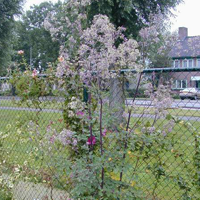 This meadow rue needs more light so stems are extra strong to support the large full heads of bloom. Think fall blooming anemone and Monkshood for companions.